San Diego-based Sublime tribute band 40oz to Freedom takes the stage at Agave in Avon on Saturday, Oct. 22. What: Sublime tribute band 40oz to Freedom, a party for Agave audio-visual tech Colin McCabe’s 40th birthday party. When: Saturday, Oct. 22; doors open at 9 p.m., show at 10:30 p.m.
Where: Agave, 1060 W. Beaver Creek Blvd., Avon. Cost: $7 in advance or $10 day of the show. More information: Call 970-748-8666, or visit www.agaveavon.com. AVON — On Saturday, Agave will welcome back Sublime tribute band 40oz to Freedom. The tribute band is no stranger to Agave. It continues to return year after year, always packing the dance floor with fans who sing and shout along to every word of the familiar songs. 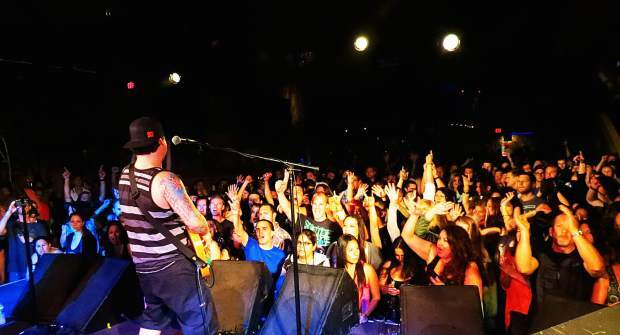 Named after the original band’s first album from 1992, 40oz to Freedom won the San Diego Music Award for Best Tribute Band back in 2010 and has been on the go and on the rise ever since, bringing the nostalgic ska-punk reggae vibe of 1990s Sublime to the masses. The band is made up of founder Dane Scott on lead vocals and guitar, co-founder Jeremy Miller on keys, Michael Hickman on bass and Carlos “Los” Perez on drums. This particular 40oz show is also a 40th birthday party for Agave audio-visual technician Colin McCabe. McCabe has been a part of the Agave family for right around 10 years. He’s has become friends with the band members over the years and is excited and grateful to have them help bring the party on Saturday. Doors open at 9 p.m. for the 10:30 p.m. show, and tickets are $7 in advance or $10 at the door. The bar at Agave will also have drink specials for the evening. For more information about this and other upcoming shows at Agave, visit http://www.agaveavon.com. For more about 40oz to Freedom, visit http://www.sublimetributeband.com.